Regular readers of A Bad Witch's Blog might expect any book I reviewed called The Witch's Handbook would be about how modern witches are nice people and not nasty hags who cackle at others' misery when they aren't actively bringing that misery about. Well, this is Halloween, so here's a book all about how to be a wicked witch, as well as how to look the part, warts and all. It is, of course, aimed at kids. And it is meant to be funny. It is. I cackled all the way through it, in true wicked-witch style. I came across The Witch's Handbook at a friend's house and loved it so much that my friend kindly lent it to me to write about for my blog - and just maybe also try out the knitting patterns for a black pointy hat and fingerless gloves with stars and moons on them. So, what's so great about The Witch's Handbook? Well, it is wonderful mixture of the traditional witch's craft, fun stuff to make or do for Halloween and humour that shows there is a bit of the wicked witch in all of us. I could only nod in agreement at the page on herb lore - knitbone as a poultice to help painful joints, soapwort for washing clothes and sage flowers to boost the memory. Wearing mismatched socks and inside-out clothes with twigs sticking out of them would not only help one get that literal hedge-witch appearance, but would also genuinely be lucky, at least as far as folklore is concerned. The basic introduction to tea-leaf reading is spot on too. Then there's recipes for scary food that I would love to try out next time I have a Halloween party. Worm Soup uses bits of spaghetti and red lentils to get that wriggly appearance and pink colour just right. Dubious Trifle contains dead flies made out of raisins with slivers of almond for wings, and spiders made out of black grapes and liquorice. And there's also plenty of advice about how to look like a witch, from gruesome beauty tips, to broom-making instructions and the above-mentioned pattern to knit a witch's pointy hat. What makes the book really appealing is that it is all done in delightful cartoon form, with great pictures containing lots of fun things to spot. Some of those things I spotted brought home a few truths. Yes, indeed, my witch's garden does have green slimy moss on the path, dead things in the flowerbeds and spiders, slugs and a stinky Tom cat as its main wildlife. I might like to have a fairy garden with pretty flowers and butterflies, but the truth is at the moment I have one that looks like it belongs to a genuine bad witch. 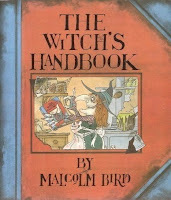 The Witch's Handbook is not a new book. In fact I have discovered it is rather rare and becoming collectible. Even second hand paperback copies can change hands for around £30. Nevertheless, if I had kids of my own, I would buy them this book for Halloween. I enjoy your blog, do you allow followers? I'm new to blogging and do not see that option on your blog - it could just be me or Blogger or do you not 'do' followers? Thanks. Samantha, you can follow it in a few ways. If you have a blogger account, then you just add www.badwitch.co.uk to your list of followed blogs. If you are on Facebook then you can follow it using the networked blogs app. If you are on LiveJournal then you can follow it as a feed. You can also follow me on Twitter @badwitch1234 - I usually tweet my daily blog posts. That was one of my favourite books growing up! That, along with "The Worst Witch," was probably the one I read the most. It definitely fits the story-book Witch more than it does the modern, Neo-Pagan idea but it's still good fun and some of the herb lore is surprisingly accurate.